The civil servants are likely to receive a pay hike if the draft 12th Five Year Plan comes through. The draft plan has set aside Nu 20bn in the first year of the 12th FYP for salary raise. The prime minister shared this while presenting the State of the Nation report in the parliament today. The draft 12th FYP has a budget outlay of over Nu 336bn. Of that, Nu 200bn is planned as recurrent and Nu 136bn as capital budget. The Nu 20bn set aside for pay increase is from the recurrent budget. 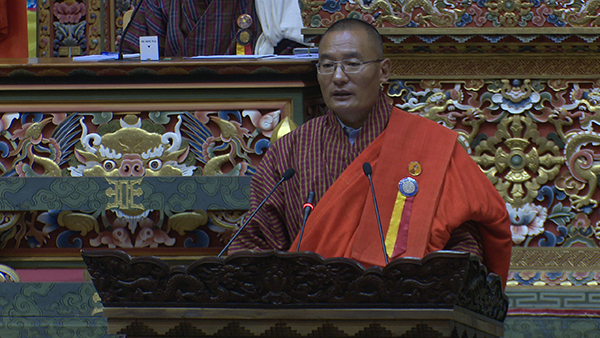 “Of Nu 200bn recurrent budget, Nu 73bn is for pay and allowances of which Nu 20bn is allocated for pay increase,” Dasho Tshering Tobgay said. The draft plan also includes an increased capital budget allocation Nu 58bn for the Local Government. The amount is equivalent of the budget for the central agencies. The increased budget is to ensure greater decentralization in roles, functions and authority of the Local Government. The remaining capital budget of Nu 19bn is planned to be spent on new high priority flagship programmes to address national issues. The flagship programmes include water security, economic development in the dzongkhags and gewogs and organic farming among others.